Windsor, a residential suburb south of Prahran, is 5 km. south-south-east of Melbourne. It is bounded by High Street, Punt Road, Wellington Street/Dandenong Road and (notionally) Williams Road on its east. Windsor’s area is more elevated than Prahran’s and it was generally favoured for settlement. Known at first as Prahran South, it was connected by railway to Melbourne and Brighton in 1860 and by a loop line to St. Kilda the year before. (The latter ceased service in 1862, and is traceable today by the linear reserve which runs into Gladstone street.) The locality was settled with small farms and a scatter of houses and business premises. There was a Windsor Castle hotel, from which the area’s name may have originated, and the name of the railway station was changed form Chapel Street to Windsor in 1867. Windsor is connected to the Chapel Street retailing spine. 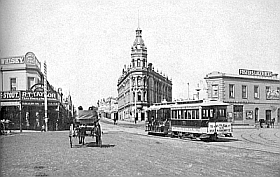 Trams were run down Chapel Street in 1888, and an extension added in 1891 to the St. Kilda route. Although the giant emporia of Chapel Street were further north, the Windsor section had a solid range of drapers, footwear sellers and homewares merchants. There were several garment factories in and behind Chapel Street. Windsor’s census population in 1911 was 3,593. Local churches provided clubs and meeting facilities, and were a strong element in the local social fabric. A school of domestic economy was opened in 1928 next to the primary school, attended mostly by girls of middle class means who valued domestic skills in the marriage stakes, rather than aspiring domestic workers. Modernism in the form of a picture theatre came in 1936, opposite the railway station. Further change in the form of postwar mobility came with some shops deserting the Windsor part of Chapel Street, as fewer shoppers used train and tram services. The Housing Commission built flats on the ground occupied by the old railway loop to St. Kilda, but not as a slum reclamation project as had happened in Prahran. A decade afterwards Windsor’s residences attracted renovators and persons of better than working-class means. The median house price in Windsor in 1987 and 1995 was 30% above the metropolitan median. In 1990 the Windsor primary school was kept open by the merger of the Prahran school with it. The Windsor technical school was also kept open, by the Ardoch secondary college (St. Kilda) being merged with it. It has become a secondary college. In the bottom left corner can be seen the original names of streets occupied by people featured in this website, such as – St Davids Street (now Uption Road), Albert Street, Peeel Street, Henry Street, Union Street, Andrew Street, Duke Street and Vine Street. In the 1960s, the Victorian Government decided to renovate the area known as St Kilda Junction (west end of Wellington Street where it joins St Kilda Road, Punt Road and Nelson Street. 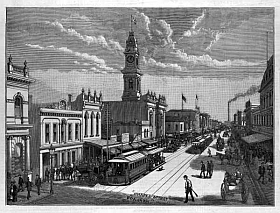 St Kilda Junction was a giant roundabout with trams running through it and was the intersection of 8 streets and three metropolitan traffic routes. This resulted in the extension of Queens Way just to the north of Wellington Street, to Dandenong Road. This destroyed Nelson and Vine Streets completely, the south side of Albert Street up to St Davids Street (the even numbers) and changed the south end of St Davids Street removing many houses (low numbers). Malone, Betty, “Old Windsor – The South-West Corner of Prahran, Prahran Historical and Arts Society”, 1989.